Upon being released from prison, Debbie Ocean hatches a plan to steal a diamond necklace worth $150 million dollars from the Met Gala. "Ocean's 8" is directed by Gary Ross, who has directed films like "Pleasantville," "Seabiscuit," and "Free State of Jones." He also wrote the film along with co-writer Olivia Milch, the writer/director of the Netflix film "Dude." This movie is not a reboot as many have suggested, it is a sequel/spinoff of Steven Soderbergh's "Ocean's" trilogy. 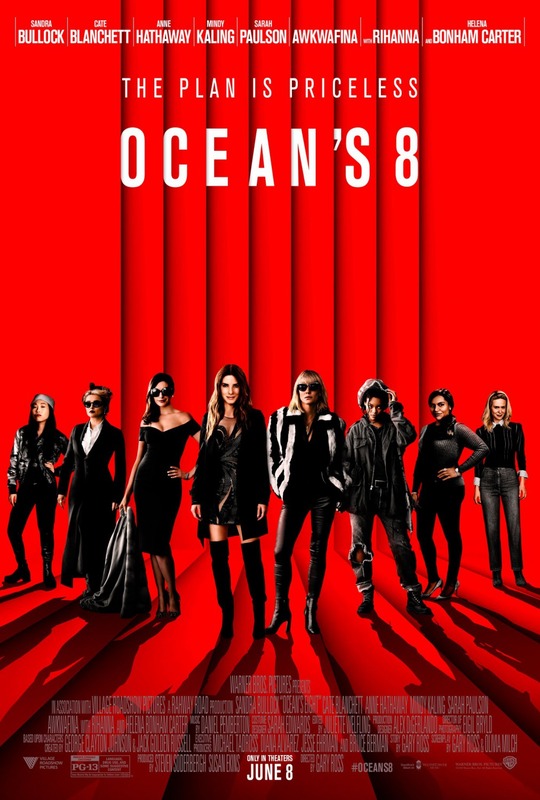 It stars Sandra Bullock as Debbie Ocean, the sister of Danny Ocean (George Clooney), who was the mastermind each of the heists in the previous three films. Much like her brother, when Debbie is released from prison, she sets in motion a plan she has been working on throughout her incarceration. Along with her longtime friend Lou (Cate Blanchett), she gathers up a team of women who each have a special skill that is needed to pull off this very complex job. 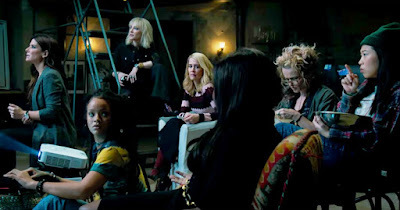 Debbie's team consists of: Amita (Mindy Kaling), who is a jeweler, Rose (Helena Bonham-Carter), who is a fashion designer, Nine Ball (Rhianna), who is a hacker, Constance (Awkwafina), who is a pickpocket, and Tammy (Sarah Paulson), who is a fencer of stolen goods. Debbie's 'Ocean's 8' is going to attempt to steal a $150 million dollar diamond necklace off the neck of an actress named Daphne Kluger (Anne Hathaway) during the prestigious Met Gala. They just have to find a way to convince Cartier to let her wear it first since it has been sitting in an underground vault for the past 50+ years. 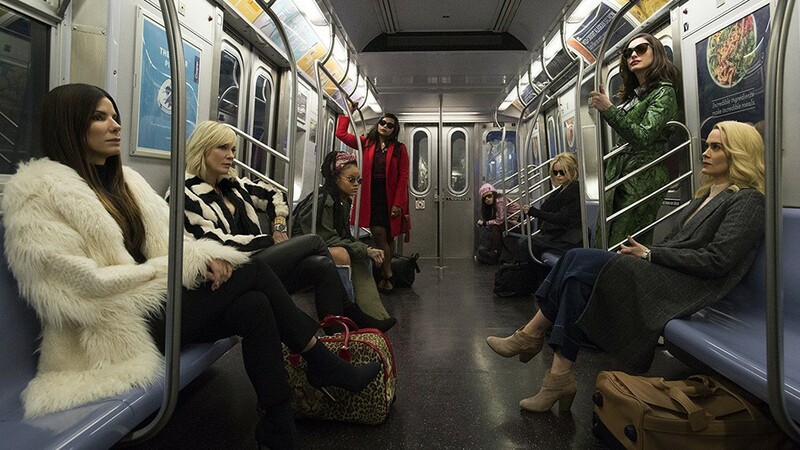 "Ocean's 8" follows the same formula as the previous films in the series. The ringleader rounds up a crew, they hatch an intricate plan, execute that plan, and then there's an obligatory twist. This movie boasts an ensemble cast of very talented women who all do a fine job in their parts. Anne Hathaway is the one who steals the show. She gets to play into the self-absorbed, over-the-top, needy celebrity role and does so in an entertaining fashion. On the flip side, it feels like Cate Blanchett is a little bit wasted though there's nothing wrong with her performance itself. We know her ability far exceeds what she is given to do in this story. Each of the actresses is given their moment to shine, though it's obvious that some get less to do than others (Awkwafina, Mindy Kaling, Rihanna, etc). 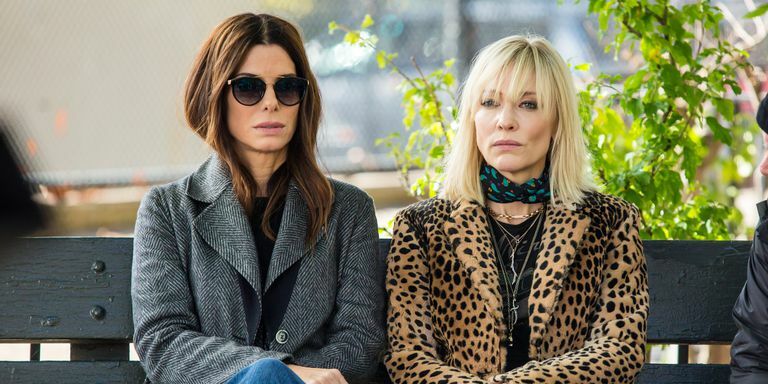 There is a lot to like about "Ocean's 8." The third act is by far the most entertaining part as we see the heist and all of the reveals and maneuverings around it play out in spectacular style. Unfortunately, the set-up feels a bit bland. The script is our biggest gripe with this spinoff and leaves a lot to be desired. The dialogue ranges from modestly funny to exceedingly stale. The pacing and editing also aren't as snappy or as fun as some of the past "Ocean's" films have been. Luckily, the chemistry between characters can be very good at times, though there are several moments that we believed was meant to be funny yet came off as a little dry. There are a lot of contrived and convenient moments during the heist, but this is par for the course with this series (and with most thievery films). We were looking forward to "Ocean's 8." Apart from a couple of fun highlights and a solid third act, it falls a bit short for us and is mostly disposable. We wish we had had more fun with this film given its incredible cast.